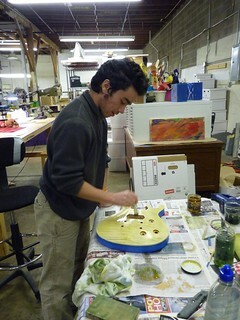 Ryan is well on his way to finishing his second electric guitar After sanding the maple guitar body until it was as smooth as polished glass and absolutely blemish free, Ryan carefully taped off the parts of the guitar he did not want to paint. Then, using yellow Rit fabric dye mixed with water he painted the entire front. He added a stronger mixture of green dye to the edges creating a starburst pattern. 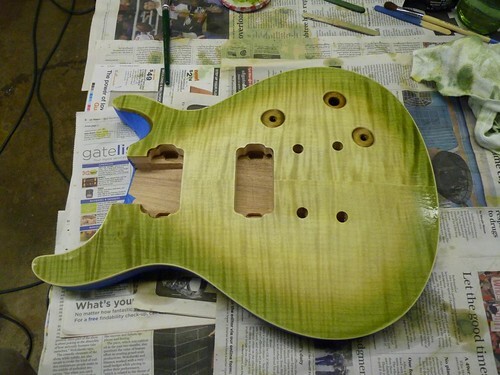 Next Ryan will seal it all under clear coats and add the neck, pickups, and strings. This has been a true labor of love. This entry was posted by Janet Lawson, MFT on Tuesday, December 18th, 2012 at 10:06 pm	and is filed under Student Projects. You can follow any responses to this entry through the RSS 2.0 feed. Both comments and pings are currently closed.